Bellator MMA debuted on April 3, 2009, and hasn’t looked back since. What started as solely a tournament concept in different weight classes, the company has moved away from that concept and started doing a yearly grand prix in 2018. They’ve has featured some of the biggest names in MMA history along with some of the biggest fights that will always stand in time. More history will be made at Saturday’s historic Bellator 206 featuring the main event of middleweight champion Gegard Mousasi taking on welterweight titleholder Rory MacDonald and the co-main event of Quinton “Rampage” Jackson battling Wanderlei Silva for the fourth time, airing only on DAZN. 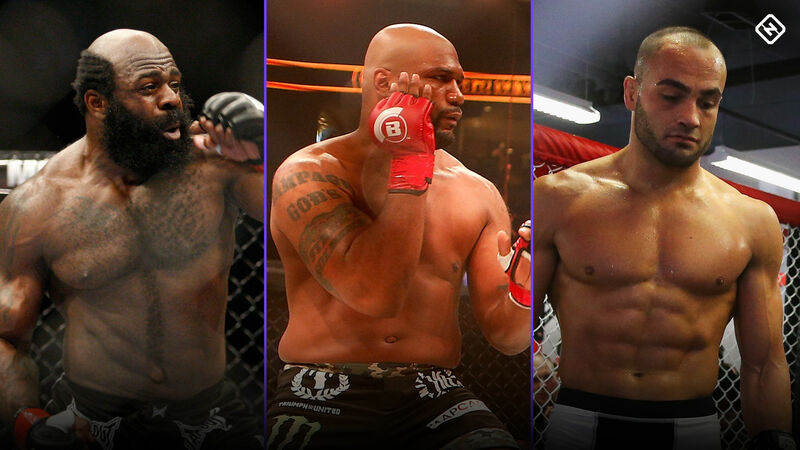 Sporting News takes a look back at some of the biggest fights in Bellator history. Many were skeptical whether the four- or eight-man tournament process was actually working. The winners were netting $100,000 and a world title shot for their efforts, but stars weren’t getting made. Enter Michael Chandler. The former All-American wrestler from the University of Missouri dominated in winning the fourth lightweight tournament. He had been undefeated in eight fights, six of those coming by stoppage. But Alvarez stood in the way. At the time, the lightweight champion sported a 22-2 record and been regarded as one of the best 155-pound fighters in the world. But that didn’t stop Chandler from coming right at Alvarez, and he nearly finished him twice in the first round. That made Alvarez realize he was in a fight and Chandler wouldn’t be going away. Alvarez took over in the third round by bloodying Chandler with vicious punches and, at one point, Chandler appeared to be out on his feet, but he somehow survived. About halfway through the fourth round, Chandler dropped Alvarez. Sensing Alvarez was ripe for the taking, Chandler blasted him with a series of blistering ground and pound punches. Trying to avoid the onslaught, Alvarez gave up his back and like a boa constrictor, Chandler snatched his back, locked in the rear-naked choke and Alvarez tapped out to become the new Bellator lightweight champion. The win cemented Chandler as one of the best lightweights in the world. More importantly, the fight was and still is the best in Bellator, it put the promotion on the map, and also proved that, while flawed for many reasons, a tournament could still work in this day and age. Between Chandler vs. Alvarez I and this time, the company had been doing OK, but needed something to give them a spark to get to the next level. In June 2014, company founder Bjorn Rebney had been fired and Scott Coker came on to lead the charge. But the one thing Bellator never had up until the hiring of Coker was that marquee fight to bring in the casual fan. Sure, the fights were good. However, you want people to see them and having a big attraction needed to be the hook. The formula worked for Coker as the head of Strikeforce and figured the model could prove to effective yet again. Enter Ken Shamrock and Kimbo Slice. Shamrock is considered one of the leading pioneers of the sport. He helped put the UFC on the map under the original owners and when the Fertitta brothers and Dana White took control in 2001. His three fights with Tito Ortiz at the time helped set television and pay-per-view records. Slice was and still is the biggest television ratings draw in MMA history. On May 31, 2008, in Elite XC, Slice made history in the first main event on network television when he battled James Thompson. Slice won by TKO in the third round. The fight peaked at 6.5 million viewers. Then he appeared on “The Ultimate Fighter” in 2010. Slice lost his first fight on the show to Roy Nelson. It was a ratings hit, averaging 5.3 million viewers with a 6.1 million peak, making it the fourth-most watched fight in MMA history at that time. The fight wasn’t a technical masterpiece, but Slice won by first-round TKO. You could see both guys were well past their primes, but it did prove to be successful. It was the highest-rated event in Bellator history up until that point, averaging 1.6 million viewers for the entire event, peaking at 2.4 million for Shamrock vs. Slice. The method worked because Coker put Chandler and current WWE star Bobby Lashley in separate bouts on the show to help raise their profiles, as he saw them as building blocks for the company. Chandler is the name people associate Bellator with the most, and Lashley proved to be a reliable ratings draw during his time in the promotion. The one thing Bellator had never done in its five-year history was hold a pay-per-view. Rebney had felt the television model would be the way to go, and Bellator would only make the jump to PPV when it felt right. The original main event of Bellator 120 was supposed to be the trilogy fight between Alvarez and Chandler. Unfortunately, Alvarez bowed out a week before the show, sustaining a concussion. Jackson and Lawal were bumped up to the headlining position and featured Tito Ortiz making his promotional debut against Alexander Shlemenko. Chandler stayed on the card to face Will Brooks in an interim lightweight title fight. Jackson and Lawal were bitter rivals looking to settle the score on who is the best among the two. Jackson won by unanimous decision in a back-and-forth fight. The event ended up generating around 100,000 PPV buys, a massive success considering Bellator had never run that type of event.